The eldest daughter of Eddard and Catelyn Stark is interested in all lady-like persuits, the opposite of younger her sister, Arya, and has a romantical nature. She is an unwilling pawn in the political manipulations of others. 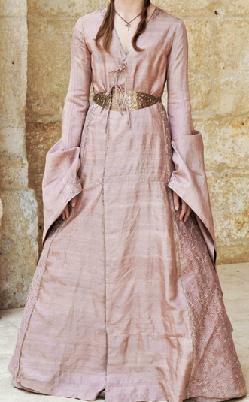 Orginally to wed Prince Joffrey Lannister (Eeeww), her fate takes a different turn. #H314 Floor length princess lined dress with V neckline and trim. Troubadour sleeves. Contrasting belt.